A half dozen tickets purchased in Iowa came within one number of having at least a share of last night’s massive Powerball jackpot. The $564 million jackpot was split by three tickets purchased in North Carolina, Texas and Puerto Rico. As of 10 a.m. today, Iowa Lottery officials had not identified any of the people who purchased the six tickets in the state that came within one number of sharing the third largest jackpot in the history of the game. “We haven’t heard from any of those big winners yet, but because people were paying so much attention to this drawing, I anticipate we’ll see them soon,” Neubauer said. 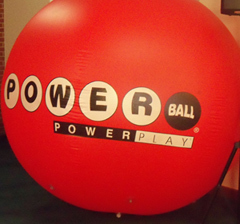 In Iowa, nearly $4.7 million in Powerball tickets were purchased for Wednesday’s drawing. “The day of the drawing is always the day with the highest sales for that particular drawing and yesterday in Iowa, players bought about $3 million in tickets alone,” Neubauer said. A total of 67,320 plays purchased by Iowa Lottery players won prizes ranging from $4 up to $30,000.